Nearly 1,150 first-year students and more than 900 transfer students will begin their SUNY New Paltz education in the fall 2017 semester, making this one of the largest incoming undergraduate classes in the College’s history. The new students will be welcomed to campus during the traditional Moving-In Day on Aug. 24, and the formal Convocation ceremony on Aug. 25. Returning students will arrive throughout the weekend before classes begin on Aug. 28. Eaton noted that although the incoming class is historically large, the College achieved this goal while maintaining its highly selective admission standards. Despite the large size of the incoming class, the College’s overall enrollment has not grown. This is due in part to the drop in the College’s graduate enrollments and the fact that a larger incoming undergraduate class must be recruited to replace the ever-increasing number of New Paltz undergraduate students who are completing their studies sooner. New Paltz’s four-year graduation rate is equal to the average six-year graduation rate for other public colleges and universities in New York and nationally. This is also the most racially and ethnically diverse class in the College’s history, both numerically and proportionately. Approximately 36% of the combined incoming class of first-year and transfer students are from historically underrepresented groups – including increases in the number of Black students and Latino students. The first-year class includes about 40% from historically underrepresented groups. New Paltz was rated in the top eight percent of the hardest New York schools to get into in a 2017 list published by the online peer review platform, Niche. The College received more than 16,600 applications from which it cultivated this historic class. The Speech, Language and Hearing Center and the Department of Communication Disorders underwent significant renovations that began in January 2017 and were completed this summer. The Center’s expanded space in the lower level of the Humanities Building now includes larger therapy spaces, improved access, modernized facilities and a larger waiting room. These updates allow the Center to train more students, better serve the local community in new and improved ways, and provide accessibility in compliance with the Americans with Disabilities Act (ADA). A groundbreaking will be held on campus in September for the College’s Engineering Innovation Hub, a 20,000-square-foot building located near the Resnick Engineering Hall. 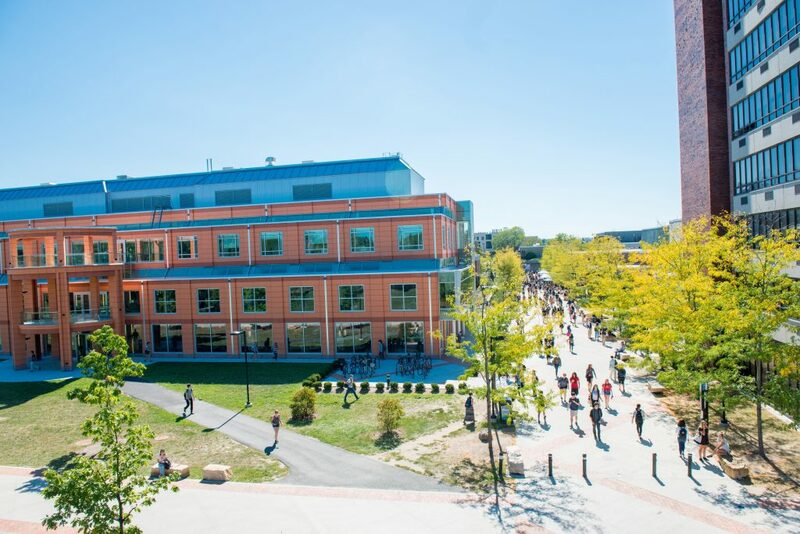 The building was made possible by Governor Andrew Cuomo’s NYSUNY2020 grant competition, in which SUNY New Paltz was awarded $10 million for its plans to improve economic development in New York State. The Engineering Innovation Hub will help support and diversify the College’s engineering programs, including the new bachelor’s degree program in mechanical engineering, and address a critical shortage in engineers needed to serve advanced manufacturing interests in the Hudson Valley. In addition to providing a home for expanded educational offerings at the College, the facility will house state-of-the-art equipment to support the engineering program and the work of companies partnering with SUNY New Paltz through its 3D printing program. SUNY New Paltz celebrated the opening of Science Hall, a modern, two-story building designed to replace the outdated science building, Wooster Hall, and to support the College’s burgeoning enrollments in the STEM fields, at a March 9 ribbon cutting. As the first new academic building on the New Paltz campus in nearly 20 years it meets the U.S. Green Building Council standards for sustainable construction and provides state-of-the-art laboratories, lecture halls and collaborative spaces for students. Science Hall is home to offices for the Dean of Science & Engineering, Departments of Computer Science, Geology, Physics and Astronomy, and Geography, and the AC2 program, which supports students from underrepresented students pursuing degrees in STEM disciplines at New Paltz. Students and faculty have praised the new space, which opened in January. SUNY New Paltz recently earned recognition from Colleges of Distinction, a unique evaluator in the world of higher education that serves as an in-depth resource for prospective students. Colleges of Distinction evaluates performance in four key categories (Great Teaching, Engaged Students, Vibrant Community and Successful Outcomes), using a mixture of statistical and anecdotal data. In order to receive this designation, SUNY New Paltz needed to emphasize core competencies in critical thinking, writing, oral skills, research and global perspectives. Additionally, the availability of out-of-classroom learning and study abroad programs at the College was essential. The process also examined class-size statistics, faculty-to-student ratio, retention and four-year graduation rates. A comprehensive Colleges of Distinction profile of SUNY New Paltz is now published online and will soon be included in a printed guidebook made available to high school students nationwide. A ribbon cutting ceremony will be held on campus in October to officially unveil the SUNY New Paltz Microgrid Project. The project comes to campus with support from the New York Power Authority (NYPA), New York State Energy Research and Development Authority (NYSERDA), the Electric Power Research Institute (EPRI) and Central Hudson Gas & Electric. It is the first of its kind in New York State, and expands both the College’s ability to generate green energy (with more than 200 kilowatts of solar panels installed on the Elting Gymnasium and Sojourner Truth Library rooftops), and its ability to store that energy for use in times of emergency or peak demand, consistent with the College’s sustainability goals and Executive Order 88, which mandates a 20% reduction in energy use by state agencies by 2020. The project will reduce campus energy usage and costs and establish a reliable back-up energy source for Elting Gym when it is being used as a community emergency shelter.